Here is a mathematical riddle. Consider the function below, which is undefined for negative values, sends zero to one, and sends positive values to zero. Can you come up with a nice compact formula for this function, which uses only the basic arithmetic operations, such as addition, division and powers? You can’t use any special functions, including things like sign and step functions, which are by definition discontinuous. In college, I ran around showing people the graph, asking them to guess the formula. I even tried it out on some professors there, U. Penn. My algebra prof, who was kind of intimidating, looked at it, got puzzled, and then got irritated. When I showed him the answer, he barked out: Is this exam over??! Then I tried it out during office hours on E. Calabi, who was teaching undergraduate differential geometry. With a twinkle in his eye, he said, why that’s zero to the x! The graph of 0x is not without controversy. It is reasonable that for positive x, we have that 0x is zero. Then 0-x = 1/0x = 1/0, so the function is undefined for negative values. But what about 00? This question is bound to come up in the course of one’s general mathematical education, and has been the source of long, ruminative arguments. There are three contenders for 00: undefined, 0, and 1. Let’s try to define it in a way that is most consistent with the general laws of exponents — in particular, that for all a, x and y, ax+y = ax ay, and a-x = 1/ax. Let’s stick to these rules, even when a, x and y are all zero. Then 00 equals its own square, because 00 = 00 + 0 = 00 00. And it equals its reciprocal, because 00 = 0-0 = 1/00. By these criteria, 00 equals 1. That is the justification for the above graph — and for the striking discontinuity that it contains. Here is an intuition for the discontinuity. Consider the family of exponential curves bx, with b as the parameter. When b = 1, you get the constant function 1. When b is more than 1, you get an increasing exponential, and when it is between 0 and 1, you get a decreasing exponential. The intersection of all of these graphs is the “pivot” point x = 0, y = 1. That is the “dot” of discontinuity. What happens to bx, as b decreases to zero? To the right of the origin, the curve progressively flattens down to zero. To the left it rises up towards infinity more and more steeply. But it always crosses through the point x = 0, y = 1, which remains in the limiting curve. In heuristic terms, the value y = 1 is the discontinuous transit from infinitesimal values to infinite values. There are reasons, however, why 00 could be treated as indeterminate, and left undefined. These were indicated by the good professor. Dr. Calabi had a truly inspiring teaching style, back in the day. He spoke of Italian paintings, and showed a kind of geometric laser vision. In the classroom, he showed us the idea of torsion using his arms to fly around the room like an airplane. There’s even a manifold named after him, the Calabi-Yau manifold. He went on to talk about the underpinnings of this quirky function. First he drew attention to the function f(x,y) = xy, over the complex domain, and attempted to sketch its level sets. He focused on the behavior of the function when x and y are close to zero. Then he stated that every one of the level sets comes arbitrarily close to (0,0). This means that xy has a wild singularity at the origin: every complex number z is the limit of xy along some path to zero. Indeed, to reach z, just take a path in L(z) that approaches (0,0). To see why the level sets all approach the origin, take logs, to get ln(xy) = y ln(x) = ln(z). That gives y = ln(z) / ln(x), which is a parametric formula for L(z). As x goes to zero, ln(x) goes to negative infinity, so y goes to zero. These are paths (x, ln(z)/ln(x)), completely within L(z), which approach the origin. In making these statements, we need to keep in mind that xy is multi-valued. That’s because xy = e y ln(x), and ln(x) is multi-valued. That is because ln(x) is the inverse of the complex exponential, which is many-to-one: adding any integer multiple of to z leaves ez unchanged. And that follows from the definition of the exponential, which sends a + bi to the complex number with magnitude a and phase b.
Footnote: to visualize these operations, represent the complex numbers by the real plane. Addition is given by vector addition. Multiplication gives the vector with magnitude equal to the product of the magnitudes, and phase equal to the sum of the phases. The positive real numbers have phase zero, and the positive imaginary numbers are at 90 degrees vertical, with phase . For a specific (x,y), how many values does xy have? Well, ln(x) has a countable number of values, all differing by integer multiples of . This generally induces a countable number of values for xy. But if y is rational, they collapse down to a finite set. When y = 1/n, for example, the values of y ln(x) are spaced apart by , and when these get pumped back through the exponential function, we find only n distinct values for x 1/n — they are the nth roots of x. So, to speak of the limit of xy along a path, and of the partition of into level sets, we need to work within a branch of xy. Each branch induces a different partition of . But for every one of these partitions, it holds true that all of the level sets approach the origin. That follows from the formula for the level set L(z), which is y = ln(z) / ln(x). As x goes to zero, every branch of ln(x) goes to negative infinity. (Exercise: why?) So y also goes to zero. The branch affects the shape of the paths to the origin, but not their existence. 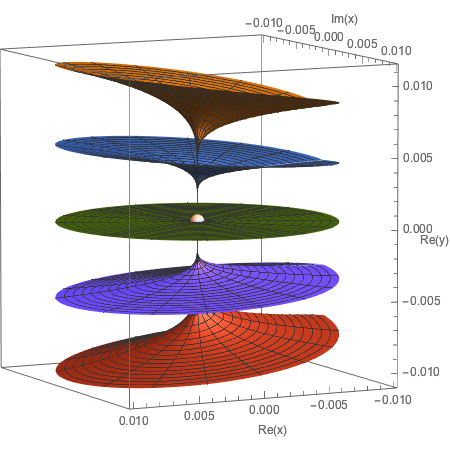 Here is a qualitative description of how the level sets fit together: they are like spokes around the origin, where each spoke is a curve in one complex dimension. These curves are 1-D complex manifolds, which are equivalent to two-dimensional surfaces in . The partition comprises a two-parameter family of these surfaces, indexed by the complex value of xy. is also “wildly singular” at the origin. These questions can be explored with plotting software. Here, the artist would have the challenge of having only two dimensions to work with, when the “wheel” is really a structure in four-dimensional space. So some interesting cross-sections would have to be chosen. • Speak about the function bx, where b is negative, and x is real. • What is , and why? Moral: something that seems odd, or like a joke that might annoy your algebra prof, could be more significant than you think. So tell these riddles to your professors, while they are still around. This entry was posted on Saturday, June 25th, 2016 at 6:31 am and is filed under mathematics. You can follow any responses to this entry through the RSS 2.0 feed. You can leave a response, or trackback from your own site. While the limiting form is indeterminate, there are good reasons to define the value as 1 despite the nonremovable discontinuity there. In fact, we use this definition all the time, sometimes without realizing it. It’s why we can write a polynomial as . It’s why we can use the binomial theorem at or . It’s why we can use the power rule at . It’s why we can write the number of functions from to as even when . See also Donald Knuth’s “Two notes on notation” (1992) and this Quora question. Thanks, I just fixed that. After studying mathematics for a while, I came to the conclusion that exponentiation of arbitrary numbers is actually a quite artificial operation compared to things like addition and multiplication; there’s only the power function defined for arbitrary and integer as multiplied by itself times, or its reciprocal times, and the exponential function defined by the limit of or the power series . It’s just a happy coincidence that they can be made to agree (and then be interpolated) by setting . Most justifications for setting rely on the properties of the former function; others are combinatorial, which still boils down to the same function. I resolve similarly the question of whether zero is a natural number: it’s meaningless, just as asking whether Pluto is a planet. I regard natural numbers as (ironically) one of the most artificial concepts in mathematics. Instead of speaking about them, one should rather refer to finite cardinal/ordinal numbers (of which zero is a perfectly valid example) or equivalence classes, under multiplication by units, of integers having a prime decomposition (in which case zero isn’t among them). What is one of the levels on which it’s wrong? This takes regions of the level sets for which lies in the unit disk and projects them into the 3-dimensional subspace of given by dropping the imaginary part of from each pair . The three surfaces shown in each frame of the animation are for values of with magnitudes 1/2, 1 and 3/2, and the argument of runs from 0 to over the course of the animation. Sorry, this isn’t showing quite what I intended. I said that z takes values with magnitudes 1/2, 1, and 3/2 and arguments ranging between 0 and , but in fact the level sets I’m showing use those values for ln(z) rather than z.
and I used that to make the image. So the image does still show level sets of the function , but the particular values of z used are a bit weird: with ranging from 0 to over the course of the animation, and taking the values 1/2, 1 and 3/2 in each frame. I made the mistake of trying to write exponents in my last comment with HTML’s sup tag, rather than LaTeX, so where xy appears, I meant . Hi Greg, that looks really nice. I fixed the typo in the article, thanks for pointing it out, and also edited your comment to make the syntax corrections you indicated. Sorry that the typo percolated into your animation. My impression from the images here are that the level sets look like they fit together in a smooth way — and each level set doesn’t have a chaotic appearance, even towards the origin. For an individual level set, what statements can be made about the tangent space, near the origin? The image didn’t show up in my last comment, probably because I used an img tag rather than just mentioning the URL. I’m a bit worried that WordPress might clone the image rather than showing the original file, which will cause headaches if I want to improve the original. So … I’ll mention the URL in human-readable form here for anyone who wants to look at it, and hope WordPress doesn’t interpret it. Since most people will be too lazy to follow that link, I copied your image to my website and put that version in your original post. If you want to change it just send me a new version and I’ll do what it takes to get that to appear (by giving it a new name). Sorry things are a bit annoying. If anyone wants to simply post an image here, just type in its URL. If the URL ends in .gif, .jpg or .png, the image will show up. Unfortunately WordPress will create a copy of your image and show that, so if you later change your image, that change won’t appear here. Another nice thing about is that it plays nicely with the convention in information theory that when , since . David, Excellent post! A beautiful example in math of investigating the simplest issue of the deepest consequence. Also, a vivid illustration of “implicit math”, that is, what goes on in our minds. I taught a precalculus course at UCSD where I tried to distill the deepest ideas. One of them was “extending the domain”, in particular, of the addition formula . Supposing that we know what this means for x, y = 1,2,3… then we can extend the domain to 0 by asking what must mean for the addition formula to continue to hold. Well, generally, and so a^0 = 1. However, at this point, if , then we could have . This issue is dealt with first and only then do we extend the domain further for x = -1, -2, -3… and derive . Whereas you use the latter to define what must be. So I find that point in your derivation unconvincing, a sleight of hand. Also, I’m curious what your thinking about means for the field with one element where 0 = 1 = infinity. Well, in that field, I think that equals 1. Andrius, thanks, I appreciate your enthusiasm for these subjects. Tomorrow when the new day brings a chance to begin again, I will speak to your concern that my argument was a kind of party trick. Regarding your question about the field with one element, where 0 = 1 = infinity, the serious answer to your question is that I don’t have an opinion about zero-to-the-zero here, because I have never thought about this field before. I just read the wikipedia article on the field with one element, https://en.wikipedia.org/wiki/Field_with_one_element, and I was surprised to see that the theory of a field with just one element was not trivial. On a first reading, I didn’t really get it. What is the connection here with infinity? David, briefly, I’ve been realizing that a lot of the discussion of the field with one element comes from considerations of the finite field Fq of characteristic q where we are counting, for example, the number of k-dimensional subspaces of n-dimensional vector spaces. The answers are polynomials in q. But then I realized that from the point of view of these fields, q is just 0. And all of this counting is ridiculous from their point of view. Kind of like counting the number of ways that you can add positive and negative numbers to get 0. And then I realized that for these fields, from their point of view, q is infinity. So for the field with one element, it’s like a clock with a single hour which means 0 or 1 or infinity, depending on how you think about it. For example, 0 * infinity = infinity * 0 = 1. These are just some thoughts I’m working on. Whereas you use the latter to define what 0^0 must be. So I find that point in your derivation unconvincing, a sleight of hand. Let me try a different approach to the same point. There are all kinds of ways that we could define , but there is only one definition of it that doesn’t call for special exceptions to be added to the general catalog of statements of mathematical facts. Anders gave a good list of these facts, in the first comment to this post. One of the clearest there is this: how many functions are there from a set of size A to a set of size B? Clearly, it is . In the article, I pointed towards another such fact: the multiplicative inverse of is . Now, if is defined as anything other than 1, we would have to modify the statements above, to say: the number of functions is , except when A and B are empty, then it is 1. And the multiplicative inverse of is , except when a and x are both zero. So, if nothing else other than sheer laziness, why don’t we go with the most “globally parsimonious” definition? For me, the rule of thumb is that is essentially always the correct convention in discrete math contexts (including, e.g., the situation where we are decategorifying from finite sets). For continuous math contexts, wherever you want exponentiation as a binary operation to be continuous on its domain of definition, it seems to be safest to declare to be undefined, and leave it at that. For different paths to lead to different limits. So the point is that it’s really just a matter of being mindful of the surrounding context — I don’t think there’s any controversy about that point for practicing mathematicians. This is the sense in which the integers have to be considered on their own in their fully discrete glory instead of as a subset of the continuum. I’ve always marveled about the exponential function. That sure looks cool. Thanks for putting it together. I am having trouble studying it in detail, because its turning pretty quickly. Can you post any still shots from this, which show the main outlines of what is going on. Or a very slowly turning version. I’m not totally sure what the axes are, because they’re not labeled, but by inference the half-axis to which the surface is attached is the positive x-axis. It appears that the surface isn’t plotted for the region with negative values for y? Was that intentional, perhaps to make the structure of the surface more visible? About 2,300 viewers were referred here from Hacker News and 265 from Twitter. If we can focus our posts on saving the planet while being this attractive, it’ll be saved in no time. Hi Trip. This a function of x. What is your statement about this function? 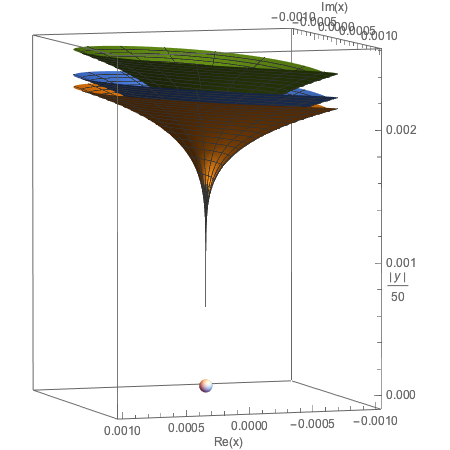 The Wikipedia article on Exponentiation has a nice aside about the ongoing debate about 0^0. It’s really wild, and kind of cool honestly, to reflect on the fact that people have been arguing this point for over 200 years! What is the determinant of the empty (zero-by-zero) matrix? Is the empty space connected? Is the empty function (from the empty set to itself) constant? Is it locally constant? Is the empty space a manifold? If so, what is its dimension? Similarly: what is the degree of the zero polynomial? The determinant of a square n x n matrix is obtained as the sum, with appropriate signs, of n factorial products, each of which is composed of n factors. If we let n be zero, this is zero factorial terms each composed of zero factors – that is to say one term composed of no factors and therefore possessing the value one. Hence the sum must be one. I’d like there to be an empty manifold of each dimension. There are times when I want a category of n-manifolds and smooth maps between them. If there’s an empty n-manifold, this category will have finite coproducts! In other words: they have coproducts (disjoint unions), and making there be an empty n-manifold means they also have an initial object. There’s also a category of manifolds where different components are allowed to have different dimensions, and this is a kind of rig category, with finite products and coproducts. In this category, the question “what is the dimension of this manifold?” doesn’t make sense; the right question is “what is the dimension of this component of a manifold?”, and the empty manifold has no components. @David: that’s the correct answer, but a much more conceptual derivation is possible. The determinant of a linear transformation from a finite-dimensional vector space to itself is the scalar by which acts on the top exterior power of , which is -dimensional. If then the top exterior power is the zeroth one, which is the unit (that is, the underlying field, as a -dimensional vector space), with acting by multiplication by . A related but more concrete argument is that is the unique answer consistent with cofactor expansion for a matrix. Here’s a new image in which the level sets are with ranging from 0 to over the course of the animation, and taking the values 1/2, 1 and 3/2 in each frame. The variable parameterising each surface is taken from the unit disk, and the surfaces are projected into 3 dimensions by dropping the imaginary component of . I made a stupid mistake in both the image above and an earlier image: the phases for all have an extra factor of compared to what was intended, and so instead of running from 0 to over the animation, they run from 0 to . No wonder these images seem to go through multiple cycles within each animation, and jump strangely between the end and the start. I won’t redo these animations, though, since they don’t really show what’s happening near the origin, which is where things are interesting. The two images below here and here hopefully make it clear what happens to the level sets near the origin. So, approaches 1 as we approach the origin along any such line. So the level set for any complex number comes arbitrarily close to the origin in , but all these sets for approach the surface very rapidly as they approach the origin. Here’s a view of the level sets for the five values . The top set is 0.95, the bottom set is 1.05, and 1 is the flat set in the middle. I’ve inserted a small sphere to mark the origin. It’s apparent here that the sets for converge rapidly on as they approach the origin. As in the previous images, I’m projecting down to 3 dimensions by dropping the imaginary component of . Here’s a view of the level sets for the three values . Here, instead of projecting into three dimensions by dropping the imaginary part of , I’ve made the third dimension a suitable multiple of the magnitude of . As with real values of , the level sets rapidly approach as they approach the origin. Nice! Are you getting any kind of mental picture about what the structure looks like as a whole? Are you getting any kind of mental picture about what the structure looks like as a whole? So not only do the level sets squeeze down into something almost 1-dimensional as they approach the origin, different level sets and approach along almost the same line when is a real multiple of . So I don’t think the foliation is pathologically twisted as you approach the origin, but most sets are squashed together ever closer to the surface , while the sets for close to 1 occupy more and more space around the origin. Here’s an attempt to show the full, four-dimensional shapes of the level sets by taking a rotating slice. Each frame gives a 3-dimensional “radial” slice through for a particular phase for . There are 24 level sets shown, coloured red, green, and blue for magnitudes 1/2,1, and 3/2, with 8 equally-spaced phases at each magnitude. The unchanging vertical green line is for . As with the other images, it’s clear that most of the level sets rapidly approach as they approach the origin, with the exception. Of course the level sets fill the whole space, so the gaps between and the other sets will be filled mostly by sets with very close to 1. If we look at exponentiation on the natural numbers as nothing more than repeated multiplication, then it seems to be impossible to justify any particular value for . There are in fact infinitely many binary functions ^ on N that satisfy and . The thing is, they disagree only on the value of for which any value will do. Thus, we might be justified in simply leaving it undefined. I see what you’re saying. However I have become conditioned to expect more from exponents, including that , and that . If it is to be defined, these uniquely determine the value of . If you want to consider other requirements in addition to just modelling repeated multiplication on the natural numbers, you might be able to narrow down to either 0 or 1. I thought it was widely agreed that multiplying no numbers at all gives the answer 1, just as the sum of no numbers at all equals 0. If so, the fact that the numbers you’re multiplying none of happen to all equal zero shouldn’t affect the answer. Just as eating no doughnuts has the same effect on your waistline as eating no sticks of celery, multiplying your wealth by zero no times at all should have the same effect as doubling it no times at all. This is just a plausibility argument, but in category theory we turn it into a theorem: the empty product is the terminal object, 1. Consider multiplying repeatedly by . We can agree that . Then . The trouble is, this equation will work for any value of . You don’t run into this problem with repeated adding ‘s. The only value that works for $0+0$ is . Correction. Last line should be: The only value that works for is . Wouldn’t 0^0 = -1 also satisfy both of those identities? No arch1, they don’t satisfy the first identity when n=0 and m=0. If you do a Google search on “0^0”, you’ll see makes a definitive claim about what 00 equals. This will annoy the ‘undefined’ camp. However, if you click on the above link you don’t get to the same page. Apparently WordPress gags when it sees the symbol ^ in a URL. Or maybe it just doesn’t like 00. That’s “escaping” the symbol ^ as a hexadecimal version of its character code. That does work. And it looks like Matt Harden wrote it that way on G+. If you ever need to write a URL with characters other than letters, numbers, dash, underscore, period or tilde (the “unreserved characters” in the table here), and they aren’t playing a role in the syntax of the URL (like a forward slash, a colon, or any of the other “reserved characters” listed in the same article), then the most robust way to write those characters is with a percent sign followed by two hexadecimal digits giving the character code. You can even do this for characters with codes beyond the normal 8-bit range, but then you need to convert the code into UTF-8 and express it as multiple bytes. This is a bit of a pain in the neck, and it can make some links to Wikipedia articles tedious to write, because they like using em-dashes and accented characters that can only be expressed this way. where is a natural number and is an arbitrary complex number. This function is used to define polynomials and power series. With this function we must have for the function to be well-behaved. where is an integer and is a nonzero complex number. where is a complex number is the exponential function. The at the bottom is just a symbol, though by abuse of notation some people define the number , which makes this power compatible with other power functions. where is a positive real number and is a complex number. We can also extend this to be defined for any in a set where can be defined consistently, or even to all nonzero if we make this a multi-valued function. We can also extend the function continuously so that for all positive real numbers . However, there is no way to extend this function continuously to (0,0), so with this function is undefined. These functions are frequently confused because in any point where two of them are defined, they give the same value. However, it is crucial to distinguish them when analyzing the expression : According to the first definition it is , but according to the rest it is undefined. Finally, applying this to your riddle, I must object to your solution as well: There is no single power function such that looks like that. The thing about , is that it’s not even discontinious at 0^y. What happens is seen by letting x approach 0, it goes up sharply at y -> 0, and always passes through 1 at y=0. Any line of the form x^ax (a sloping line) converges on 1 when x = 0, without dispute. Edging along the line of y=0, and x ->0, is a kind of division by zero.